Steve Feeney Productions provides a full production service and Steve also works as a freelance camera operator for other producers who need extra camera support for live events etc. He can work as part of a live camera crew responding to a director or alone depending on the producer’s needs. When working for other producers, Steve will never promote his own business. This includes not wearing our branded clothing, handing out business cards attempting to “connect” with your clients via social media. These are the same standards that we expect when we hire freelancers. Click on image to get a full list of kit. 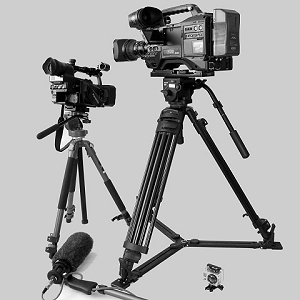 Steve works with our own cameras (Panasonic HPX371 or Panasonic HVX201) in broadcast quality HD (high definition) or standard definition in true 16:9 (wide screen) or 4:3 (non-widescreen) as required. He can also work with any camera supplied by the producer. Steve has the lighting kit to enable him to work in most situations and can hire additional lighting as required. Check out the kit we have available. What Does It Cost? Visit the Freelance Camera Rate Card. Live event camera work at Excel Centre in London, Cardif Conference Centre etc. Contact Steve Feeney to discuss your requirements.